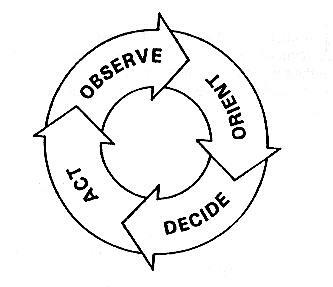 One of the more “cutting edge” concepts in tactical thought is the OODA loop as developed by the late Col. John Boyd (USAF). He was a scholar in military tactics, and is one of the greatest influences in America’s military tactical doctrine. Boyd studied the high kill ratio US pilots were were having (10:1) in Korea when the Koreans had better aircraft (MiG). Boyd found that the US had better trained pilots, the F-86 allowed better visibility than the MiG, and it had controls that allowed faster maneuverability. Based on these observations Boyd reasoned that the better-trained American pilots could observe the enemy more quickly because of better visibility, and they could decide on a course of action faster due to good training. Once the course of action was decided, the faster control on the F-86 allowed it to execute maneuvers much faster than the MiG. Thus an F-86 pilot had little lag time in observation-orientation-decision-and-action and could operate inside the adversary’s response time envelope. 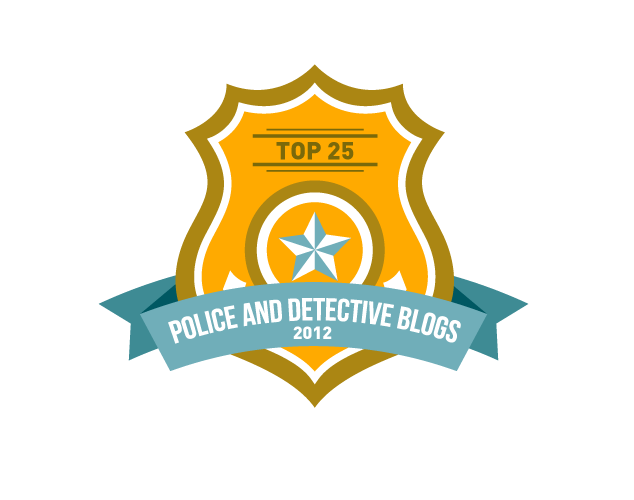 The extension of these findings found their way into all areas of personal combat. All conflicts are duels between competitors. In these duels each competitor OBSERVES his opponent, ORIENTS himself to the opponent and the unfolding events, DECIDES on a course of action based on that orientation, training and experience, and finally ACTS out his decision. This is the OODA Loop. Whoever can move through this process faster, gains the advantage over his foes by disrupting their ability to respond in a timely or effective manner. The Orientation portion of the cycle is the most important, and the weak point whereby an opponent may penetrate the decision cycle. Each of us bases our decisions on observations of the outside world that are filtered through mental models (sometimes called paradigms) that orient us to the opportunities or dangers presented by our observations. In confrontations, an opponent makes decisions based on his orientation to the situation. This orientation changes and evolves because it is formed by the ongoing interaction between observations of unfolding events and a mental dialog that strives to make sense of the situation. With this understanding, we can see that an aggressive operator who initiates the action after proper observation, orientation, and decision will have an overwhelming advantage over a reactive individual. The basic reason is that the aggressive operator’s cycle is at the end or action phase, whereas his opponent’s cycle is at the beginning or middle. The aggressive operator has already oriented himself to his opponent (sometimes simply recognizing that he is an enemy is enough), and decided on a course of action based on that orientation. The accuracy of the decision is determined at the Orientation part of the cycle by the information available to the operator, as well as how it is filtered and organized. The orientation phase is the most critical part of the cycle since it shapes the way we interpret the situation. Everything is based on having good Situational Awareness (Where Am I? What is Going On Around Me ? Where Am I Going ? What Will I Do When I Get there?). An unfolding confrontation may be avoided, or it may be overcome unannounced, from a position of advantage. An example of this in Martial Arts is the simple triangle step. The opponent attacks and we move into or away from the strike with our footwork. The opponent OBSERVES our avoidance and new position and attempts to ORIENT himself to it and deliver another attack. But we have already blocked/avoided the attack and have a counter on the way. We ACTED before the opponent could finish his orientation, thus entering his OODA loop. The key is aggressive action and keeping the pressure on so we stay that step ahead. It sounds simplistic, but is considered the American equivalent of say “The Art of War” when any conflict is looked at in this way (military, personal combat, business, sports) and techniques are analyzed and developed with it as its model, good things have been happening. “Whew” I must be becoming a tactical geek. Hope that all made sense. Much like “The Book of Five Rings” and “The Art of War” this stuff provides “principles” that you can use to “leverage” a situation to your advantage or to evaluate your training,much like we take advantage of natural human physical reactions and mechanics when training (a blow here will make your opponent do(X) or move in this direction, etc etc.). I think the “advantage” of looking at OODA as a concept is that even with a “microadvantage” in time, as long as you are able to stay that step ahead of the opponent, the advantage begins to multiply as you keep Acting faster than the other side can respond. Much like in Maneuver Warfare doctrine where, when its done right, the force with the OODA advantage levers a small advantage/penetration into having the ability to strike the enemy at will. When the momentum stalls is when you run the risk of having the tables turned.